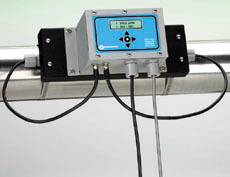 Controlotron Corp., of Hauppauge, N.Y., the leading manufacturer of high accuracy clamp-on, transit-time flow meters, now offers reliable, clamp-on flow measurement at half the cost. The easy-to-use design minimizes maintenance expense while achieving flow rate accuracy of 1 percent or better for most applications in 1??-360?? (25 mm-9,000 mm) diameter pipes. It also incorporates a new integrated flow computer/transducer mounting package, which cuts installation time and simplifies product selection.